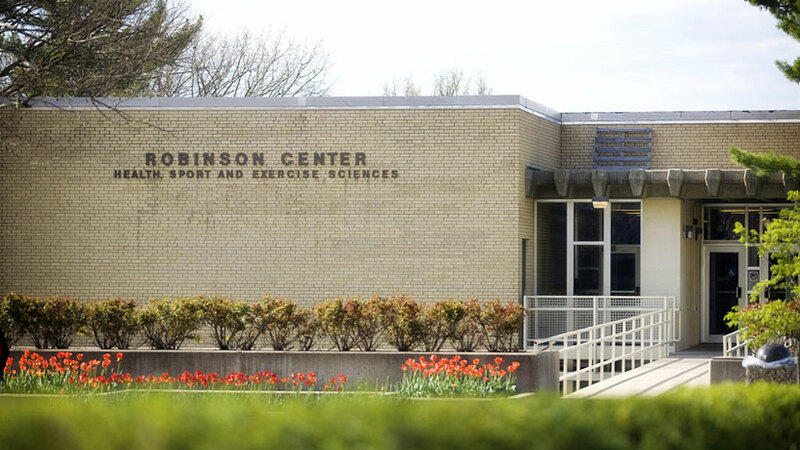 Robinson, the second KU athletics facility to bear the name, houses the School of Education’s health, sport and exercise sciences department; faculty and staff offices; biokinetic, kinesiology, and physiology labs; classrooms and multipurpose rooms; the dance department offices and studios; and lifetime sports facilities. It also has locker rooms, showers, weight rooms, a six-lane competition pool and diving well in the natatorium, and other facilities for competition and for faculty and staff use. When the Student Recreation Fitness Center opened in September 2003, intramurals and personal fitness facilities for students moved to the new building. The first Robinson Gymnasium was completed in 1907 and dedicated at Commencement 1908; it was built on Jayhawk Boulevard on land originally owned by Charles Robinson, a founder of Lawrence and first governor of Kansas, and was named for him and his wife, Sara T.D. Robinson. Students had organized gymnasiums in the basement and north tower of Fraser Hall and in the basement of Snow Hall in the 1880s and 1890s, but only in 1905 was funding approved for a dedicated gym. James A. Naismith, a KU professor of physical culture since 1898 and the inventor of basketball, was instrumental in the building’s design. University functions such as Commencement and lectures took place in its auditorium. By the 1960s it was outmoded and overcrowded, and the decision to build a humanities building on the site of Robinson and the adjacent Haworth Hall was made. Both were razed in November 1967 and Wescoe Hall constructed on the site.